From what I can tell this money came from the general fund, i.e. mostly undergraduate tuition money from CAS students. The scholarships go to law school students with decent LSATs. More than a few get a full ride. For comparison, the UO Foundation spent roughly the same amount on academic scholarships for the entire university. (Albeit twice that on athletic scholarships). The law school has now shrunk to about 500 students, so the average law student is getting about $9K in tuition discounts each year. Correction: An apparently well-informed correspondent reports that the law school now has only 360 law students, about 100 1L’s, and that more than half of new students are receiving promises of complete tuition remission for 3 years. Rob Illig won the fight against Michael Moffitt and Margie Paris’s plan to use faculty raise money to support public interest jobs for graduates, but Moffitt was able to convince the administration to support this far more expensive scholarship plan to game the US News ranking. Rumor has it that these scholarships are 3-year promises, so the bleeding is not going to stop soon – in fact it may well increase. Tagged Jamie Moffitt, Law School, Michael Moffitt. Bookmark the permalink. No, you are missing the point here entirely. Being married to the person holding the purse strings is what really matters. Forget investing in recruitment of solid students. Double dipping into the cookie jar is the way to go here. Sheesh. And we shouldn’t be worried that the faculty’s one representative on the board is from the law school? No conflict of interest there? The faculty rep has to be from somewhere within the university. How would you hope to avoid some kind of conflict of interest, if that is what it is.? They’ll always be there, but given that the board already has lawyers, business folks, graduates for journallism, graduates from humanities, I would prefer someone from the hard sciences or at least from CAS (given CAS has been raided so much by other units on campus). Also just think how much our selectivty would jump up if we doubled the amount of financial aid we offered? 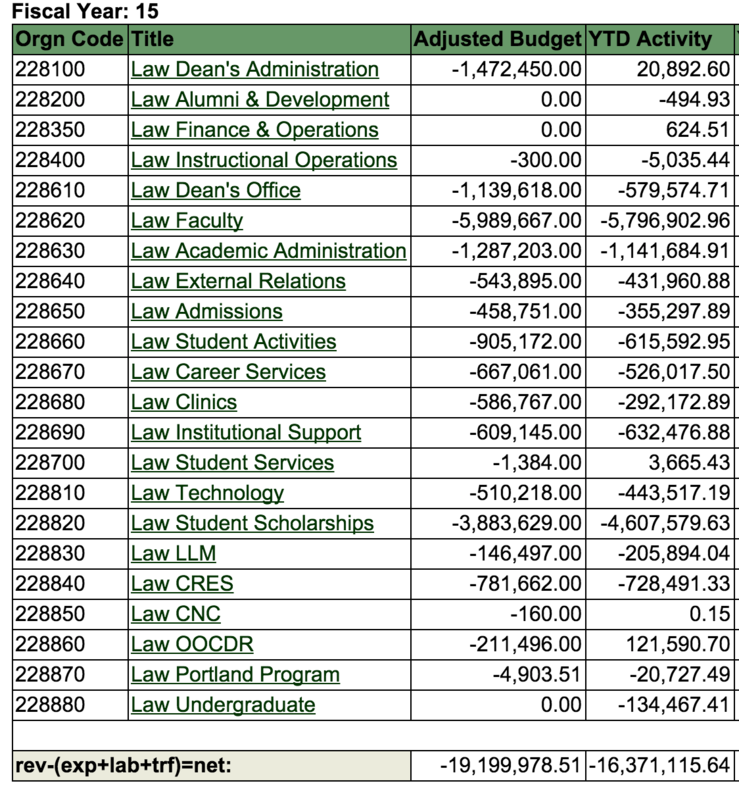 This seems to be a big chunk of the CAS deficit, which I hear is roughly $7 million, down from $10 M. The two reasons for subsidizing the law school that I’ve heard are first, if UO closes or loses the law school, there’s simply not a critical mass of schools to make up a “major university” especially AAU style. This makes sense even if I don’t like it. The other explanation is that UO is afraid that the legislature, being made up largely of UO law graduates, will severely reduce or eliminate what remains of the state subsidy, without which UO could still not survive without major changes, i.e. a big boost in in-state tuition, which the state might not allow. This latter explanation frankly strikes me as kind of nuts, I mean I know, Oregon is a strange state, but can it really be that strange? The law school may be in a death spiral, due to the severe decline of the law profession, too bad it affects the rest of UO. We should not think that only the law school is at risk. Latest figures I’ve seen show a drop of about 9% in in-state enrollment. Not made up for (at least in student numbers) by out of state. Rightly or wrongly, there’s a lot of seething anger at universities for tuition hikes, and a lot of skepticism that college is worth in any more. What is happening to the law school could happen to the rest of the university, at least on a milder scale (but larger scale for that). The cost-benefit test for humanities is misleading because the market returns of degrees are distorted. Students pay the same tuition for their “low-cost degrees” and subsidize de facto other units – especially absurd if the tuition money goes from low-earning graduates to the law school’s high-earning graduates. It would be more appropriate to think about the tuition model – either with price discrimination in sticker prices or more scholarships for humanities. Their students can make a living but not regain, from their perspective, inflated tuition prices that finance anything else but enhancements to their education. In the past it worked with state support and progressive income taxes. With disappearing state funds there should be a new model or the humanities will earn ever increasing negative returns without being the cause for it. Agree that the second explanation is nuts. The first (well actually either of them) should be argued out in the open. We are a university, not a business. We are allowed to run some money-losing activities if we think they are important enough for whatever reason (mission, appearances, politics) to be worth subsidizing. If someone thinks having a law school meets that standard, they can try to make that case to their peers. Redo your math. UO law enrollment is now only 360, and about half of new students are paying $0 tuition. The UofO is a business now. Not a well managed business by any stretch of the imagination, but it is a business. We were a university at one point a long time ago. The UofO has sponsors, overpaid executives, under paid employees doing all the work, a branding department, lawyers constantly in court or dealing with legal troubles. Make no mistake that UofO is a business. At least those bumbling twerps at the top would treat it like that. Speaking as a former law student at UO the school used to be very stingy with scholarship money compared to other law schools. This used to be okay because they were considered a “value” school with cheaper tuition. However, I’m not sure that’s still the case with tuition rising. Have they gone overboard now by offering too many scholarships? I don’t know, but with more top students wising up to the fact that a law degree is not a guaranteed six-figure job (or just a job) and choosing different professions, schools need to do more to compete for the top students that are left. If the University cares about having a law school that matters, then offering more scholarships is just a part of doing business, like it or not. The law scholarships need to be evaluated in the context of all priorities across the university. Maybe all other units need to cut to the bone in order to maintain the law school and the relatively high salaries of law professors. But maybe not. My sense is that the law school will have a hard time adjusting to the new world of 50% law student unemployment. It would have been good to see the discussions about this. I guess if the bar is “branding is worth $10M” then all sorts of expenditures make sense! Or another way to look at it is that law school is using the money to subsidize the salaries of law faculty and justify their existence. Without students, what are the options for a relatively sizable number of tenured faculty? If the UO were actually run like a business, we would just accept the fact that the market needs fewer students and make the appropriate cuts to the labor force. The law school doesn’t just have a lot of professors. If you look at the faculty roster you will see that a huge percentage of them have endowed chairs/positions of some sort, despite their low rankings in scholarship. They have fundraised for faculty, not students, now they rely on CAS funds to support their students. This is why the whole situation needs reassessing. Market forces or no, it would be a dismal shame if the only public law school in Oregon closed its doors. Lewis & Clark no longer offers a legal clinic and the general public needs to jump through hoops to use the law library during very limited hours. In contrast, anyone can use the UO law library or clinics. The most regrettable effect of the privatization/corporatization of the University is the atrophy of civic responsibility and access that is the original purpose of any public institution. Many people would blame the legislature, but this is a two-way street.